If rapes and scams weren't raining enough misery, we have unexpected meteor showers and incurable swine-flu. Why you wonder, why is there no sense of justice? Bad is happening to good people. Good is happening to bad people. Blasts are happening to the common man. Commissions are happening to the powerful. And nothing is happening to the economy. Power is happening to Mr. Gandhi. Lay-offs are happening to professionals. And nothing is happening to Mr. Kalmadi. Recently when a raped and brutalized girl did not survive, even though a nation of one billion prayed for her, there was huge disappointment. Isn't there immense power in heartfelt prayers? What happened? As a teenager, I recall studying consistently to clear the medical entrance exams. My father, a doctor, wanted me to study medicine. I wanted to be a doctor because my father wanted it. As it happened, despite the hard work and heartfelt prayers, I failed to clear the entrance test. Thank heaven for that! Today I realize that medicine was not the profession for me. Not all prayers are answered. Perhaps when a prayer goes unanswered, it is the answer. I am sure it happens to you. I recall questioning my faith when my father was battling a deadly disease. Fervent prayers went unanswered. Father succumbed after a brave fight. My sense of justice and injustice went for a toss. There were days when it was agonizingly impossible to have faith in faith. I had no answers for the suffering of a kind gentle soul. No karma theories, no religious texts and no truisms could offer satisfactory answers. But strangely, my faith was back after a brief period. I am not sure how and why faith springs back. More often than not, it does. Perhaps, faith is not the belief that universe will do what you want. It is the belief that universe will do what is right. Surely, the universe functions on certain rational laws. Nothing can happen by chance, can it? Or is all about chance? The ‘Chance pe Dance’ is really mind boggling. It compounds confusion when we are faced with unexpected meteor showers, tsunamis, earthquakes and bomb blasts. Another funny thing about faith is that it stems from no rationale. Often faith speaks through inner voices, instincts and hunches. No wonder they say, 'Some things have to be believed to be seen'. We are all seeking and searching. In my search, the following lines I read somewhere provide immense strength. 'Faith is all about coping with the darkness, the emptiness and the pain. And letting the darkness remain until some light returns'. My mother taught us never to ask for any particular thing while praying. She always told us you must ask the Lord to do what is right for you ! I agree with you - Faith is not getting what you pray for its having a firm belief that God will always give you what is right for you ! What a lovely thought. Faith is having trust in Him despite all the negativity. A very thoughtful post Alka! It is the power of faith that keeps many of us going despite being pitted against heavy odds! Yep, it helps in coping with adversities. Really faith plays games but as you said it might be the belief that universe does what is right. It is a difficult thing to accept though. Honestly, I don't know the answers. I am seeking and searching. Have you read Srini's book 3 Lives? It addresses thee questions. I also remember a post about faith that Zephyr did that was very inspiring. For someone like me, I have loads of faith in many qualities, in myself and in family. But I don't equate faith with religion. I am not religious at all. And faith I feel is actually a way of believing deep within your soul that you can do it or that everything will happen for the best. A thought-provoking post as usual. I haven't read the book.Will grab it when I can. Yes, I remember Zephyrs post and yours too. (Life of Pi). Perhaps faith is what keeps us all bounded. Lovely post! Thank you for reading and appreciating. Loved this one Alka. It instantly pumps positivity in the reader. When I finished reading this remembered Bruce Almighty's dialogues. I love all of them but one line goes like this.
" Y dont You give us what all we ask for"
" I dont give what all you ask. I give you what You need!" I know it better. I dont remember the exact words but its some thing like above ! *Hugs* for this good post! Faith Is not based on rationale. But it gives immense strength. Firs of all: Thank you so much for the write-up. It speaks right up to those like me who are stranded nowhere. It is difficult to be consistent with anything these days. One fine day Lance Armstrong comes out to be a cheat. 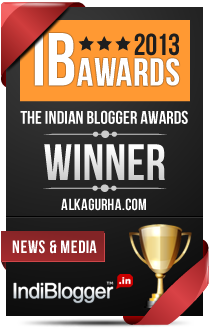 The Hyderabad blasts and so on and so forth. It is as if there is a campaign by some invisible force to bring down the established sense of well-being. How does one believe in happy endings, and all the good things they say ? Maybe you are right. I don't know and can not deny your proposition either. Maybe it will get better with times, maybe it won't. I am reading one of my favourite novels again these days Ma'm: Atlas Shrugged. If you have read it, you would realise how apt it is for our times. Once again, thank you so much for articulating the scene so well. Honestly, I am also seeking and searching. Faith helps in coping with adversities. There is no real state of no belief. Those who don't believe also believe in the idea of no belief. I am writing this believing that you will read this. Thank you for reading. The bomb blast and anarchy all around is disturbing. My copy of Atlas Shrugged is very old....some pages are missing. Will have to order a New one. Nevertheless it's a classic. I was looking for suitable words to describe this post but I cannot find the apt word....for now let me say it was just BRILLIANT! Faith is what keeps us strong and hopeful! Welcome here. Thank you for the recommendation. It means a lot. "Perhaps when a prayer goes unanswered it is the answer." Completely agree with this Alka. Not getting something, turns out to be a blessing in disguise which we are unable to realize at that time. This is so true, especially when we look back and contemplate. Nothing wrong with courage except that it may not succeed at times. So many brilliant lines, I am going to bookmark it and read it again and again. Thank you dear. Your words mean a lot. Alka,I am very positive of the future. We are going through the last phase of Kalyug which is a cycle of 2500 yrs. I am grateful to you Mr. Chowla. Thank you for the reference. Your optimism is infectious. Makes me smile. I am losing hope and no longer believe in good things happening to good people. Hold on Ria....as I said faith is about coping with the darkness until some light returns. That was a decade ago. He was young and I was Daddy's little girl. Keep writing. Your 'Words' have a calming inspiring effect. Isn't faith driving this world, Alka? We pray god, things don't happen the way we want. yet, we hope for the best in the worst. We just hope. And hope and faith go hand in hand. Irrespective of the disasters and the chaos, we still hope..we can't hope if we don't have faith. It all depends on how we see life. Some may associate faith with hope, rightly so but others call it living in dreams. It's all about interpretation. Life lives on hope, is an undeniable truth. That's one way of looking at it. You are associating faith with dreams while some others have linked faith with hope. today only I finished watching Life of Pi.. I wrote this piece after watching the movie. It's about faith, hope and surrender. Wow.. This is strong writing.. I think this article can be interpreted on multiple levels. I too kept thinking about Life of Pi.. when i went through the entire article. As the movie depicted, whatever gets you through the sea of calamity to the shore is important. You have to hold on and believe in something to get you through difficult times. The atheist have faith in themselves. They know its them against the world and there is no one else to their rescue. The believers entrust their faith in a higher being whom they think will take care of their problems. yeah so whatever gets you through... :) You have to hold on to a particular faith.. Such a lovely comment. Yes, I wrote this after watching the movie which was about faith, hope and finally surrender. Actually, there is no state of no-belief. Those who do not believe, believe in the act of not believing. I wrote this believing that someone will read it and you read it believing that it will make some sense. At the end, whatever gets you through, as you say. Faith is personal and stems from no logic. Quite a few people mentioned it reminds them of LIFE OF PI - even my thoughts wandered there :) Wonderful post! Keep writing :)This is your best so far, if I may say so! Yes, we all have personal ways of dealing with such issues. Thank you for visiting. Akshay, hold on and hang in there. Trust me you will be eating chaat at the Forum Mall, and enjoying Chinese at UB City soon. 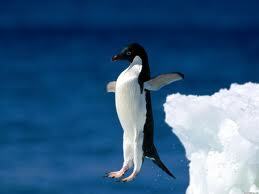 It is very good a penguin jump in the sea.